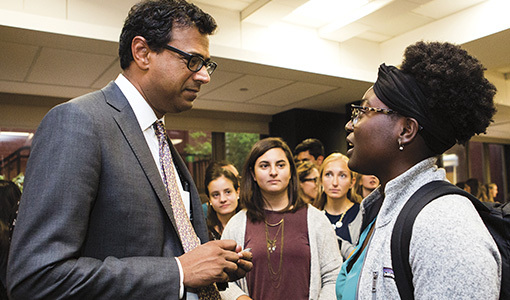 Lessons from writer and surgeon Atul Gawande. How can doctors help their patients better prepare for end of life? It’s a question that Atul Gawande grappled with in his 2014 New York Times best seller, Being Mortal, and explored during his Dr. Maurice Segal Lecture at the Sackler Center on September 15. Being Mortal was the Common Reading Book Program selection for all incoming medical students this fall. In addition to being a surgeon at Brigham and Women’s Hospital and a staff writer for The New Yorker, Gawande is cochair of the Massachusetts Coalition for Serious Illness Care, which seeks to ensure that medical treatment aligns with patient “goals, values, and preferences at all stages of life and in all steps of their care.” The group has reached out to School of Medicine Dean Harris Berman and the state’s other medical school deans to collaborate on curriculum changes around these issues. Here are a few things we learned from Gawande’s talk. TALK IS POWERFUL Gawande cited a 2010 study led by Jennifer Temel from Massachusetts General Hospital that followed two groups of stage IV lung cancer patients. In one group, the patients received usual oncology care, while the other received usual oncology care plus visits with a palliative care clinician. The patients who spoke to a palliative care clinician chose to stop their chemotherapy earlier and had a better quality of life. In addition, Gawande said, they spent more time at home, underwent fewer surgical procedures, and spent less time in the ICU. “And the kicker was that they lived 25 percent longer,” he said.